A week ago Joe Johnston signed on to direct "First Avenger: Captain America" and now this week the film has found its writers. The writting team of Christopher Markus and Stephen McFeely have been hired on to pen the script for Marvel studios THR is reporting. Markus and McFeely have worked previously together on both The Chronicles of Narnia films and the HBO film "The Life and Death of Peter Sellers." Kevin Feige, who has produced nearly every Marvel comic book film that you can name X-Men to Iron Man, will again produce Captain America. Feige is also slated to produce upcoming Marvel titles Iron Man 2, The Avengers and Doctor Strange. 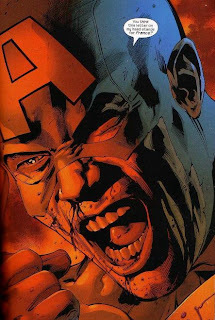 Markus and McFeely seem to be decent choices for Captain America. I can't say that I was blown away by either of the Narnia films, but they are entertaining. With a Joe Johnston directing and giving some his input it seems First Avenger: Captain America has a very family orientated production team. Johnston directed Honey I Shrunk the Kids and Jumanji, while the two scribes have had the bread and butter from Narnia. Joe Johnston has directed Hidalgo and October Sky which were both decent. Alot is hanging on well Johnston latest "Wolfman" with Benecio Del Toro pans out. For now Johnston and Christopher Markus & Stephen McFeely can begin hammering out the proposed synopsis that Marvel released awhile back.